* 19 year-old Englishman, James Alexander Holden, arrives in Adelaide, South Australia. * James Alexander Holden establishes a leatherwork and saddlery business, J.A. Holden & Co., in King William St, Adelaide. * Birth of J.A. Holden’s eldest son, Henry J. Holden. * J.A. Holden & Co. expands, moves to bigger Adelaide premises. * Further expansion sees the addition of a new business: the repair and renovation of horse-drawn carriages. * 20 year-old Henry J. Holden joins the company, now called J.A. Holden & Son. * Harness and carriage maker Henry A. Frost becomes a partner and the firm is named Holden & Frost. Henry J. Holden is the senior partner. Goods manufactured include harnesses, saddlery, travel goods, gun cases, whips, crops and vehicle hardware. * Death of James A. Holden. Holden & Frost becomes a major supplier of harnesses, saddlery, belts and other Boer War equipment under government contract. * A third generation Holden, Henry’s eldest son, Edward W. Holden, joins the business. * In the US, the General Motors Corporation is formed. It includes the Buick Company, Oldsmobile, Oakland and Cadillac. * Holden & Frost open a motor trimming department, the products marketed as Holdfast Trimmings. * Holden & Frost begins production of complete motorcycle sidecar bodies. * Holden & Frost produces its first custom-made car body. The GM Export Company appoints its first field representative in Australia; import of the first GM cars begins shortly afterwards. * The Australian Federal Government’s wartime trade restrictions (decreeing that only one complete car be imported for every three chassis) leads to a decision by Holden & Frost to commence large-scale production of car bodies. Holden Motor Body Builders is set up as a division of Holden & Frost, with Henry J. Holden appointed as Chairman and Edward W. Holden as Managing Director. It begins design and manufacture of a standardised car body for Buick and Dodge chassis. * Holden’s Motor Body Builders Ltd (HMBB) becomes a registered company. Annual car body output for various makes reaches 587. Business booms as the use of state-of-the-art machinery and innovative techniques ensures a competitive product. * HMBB builds an impressive reputation and bodies for Dodge, Buick, Ford, Chevrolet, Studebaker, Overland, Hupmobile, Essex, Durant and Dort – and some European marques. * Holden’s employs over 1,000 workers and produces 240 car bodies a week – more than half the national output. Holden plans the country’s most modern production line at a new facility in Woodville, SA, and gains exclusive rights to assemble GM cars in Australia at this plant. * Holden begins production at Woodville, continues making bodies for other chassis importers at its original, now extended, King William St, Adelaide, plant. Total annual production of 22,150 units includes 11,060 for GM. * Holden’s body-building operation produces over 34,000 units, including the first closed body types. With a workforce of 2,600 and 16 hectares of factory floor, it is the largest outside North America and continental Europe. In addition, HMBB turns out tram and bus bodies and railway carriages. * Henry J. Holden dies and his son Edward Holden is appointed Chairman and Managing Director. General Motors Australia Pty Ltd (GMA) is formed. It has headquarters in Melbourne and soon opens assembly plants in Melbourne, Sydney, Brisbane, Adelaide and Perth. * Holden’s now-famous ‘lion and stone’ symbol, which represents the legend of man’s invention of the wheel, is first employed. * Australia feels the full effect of worldwide economic depression and Holden, having just completed a major expansion, is caught off-guard. Motor body orders plummet and attempts at diversification fail. * General Motors purchases Holden Motor Builders and merges it with General Motors (Australia) Pty Ltd to form General Motors-Holden’s Ltd (GM-H). Sir Edward Holden is the company’s first Chairman. A.N. Lawrence is Managing Director. * Laurence J. Hartnett, a former Director of Vauxhall, takes up duties as Managing Director. * Holden produces its first ‘All Enclosed Coupe’ for Oldsmobile, Pontiac and Chevrolet chassis. Dubbed ‘The Sloper’ this uniquely Australian design is the forerunner of the hatchback. * Holden builds its first all-steel bodies. * GM-H sets up new headquarters and a new assembly plant at Fishermens Bend, Melbourne, on 20 hectares of land. The facility is opened by the Prime Minister, Joseph Lyons. * Holden produces 32,489 vehicles, claiming 40 per cent of the market. * Overall profit exceeds £1 million for the first time. * Hartnett and GM-H executives discuss manufacture of a complete car within Australia. * Holden installs the country’s largest metal stamping press, at Woodville. * The investigation into building an Australian car intensifies. Several designs are contemplated and a study known as Project 2200 commences. * Construction begins on a new assembly plant at Pagewood, NSW. * When war is declared in September, Holden places its plants, personnel and facilities at the disposal of the Federal Government. * Holden’s wartime workforce, peaking at 12,000 in 1942, operates from seven plants nationwide and turns out supplies for Australian and US armed forces. Items produced include aero and marine engines, aero assemblies, marine craft, and over 200 types of vehicles, among them ambulances, armoured cars and Blitz trucks. Armaments production includes field, anti-tank and anti-aircraft guns, bomb shells and torpedo engines. * With military contracts slowing, GM-H begins work on a design study, ‘Project 2000’. Experience and skills gained from wartime production, with the technical support of the parent company, put GM-H in a good position to take on the challenge of building Australia’s first successfully mass-produced car. * A ‘Project 2000’ prototype is produced; many variations and alternative designs are considered. * Laurence Hartnett sells to General Motors the concept of all-Australian manufacture. * The Project 2000 car design evolves into ‘Project 2200’. GM-H engineers and technicians travel to the US to study manufacturing operations and assist with design and construction of experimental prototypes based on GM’s 195-Y-15 six cylinder light car project. * A joint US-Australian team in Detroit produces three handmade prototypes of the Australian car. All are shipped to Australia, complete with detailed project plans and accompanied by engineering project team members. * Harold E. Bettle is appointed Managing Director. * The prototypes are exhaustively tested for durability and reliability on public roads, component modifications are undertaken. * All GM-H departments are asked to submit suggested names for the car. Short-list favourites include CANBRA, GMH, GMA, GEM, LION and HOLDEN. * £1,200,000 is spent on mechanical fabrication, engine and transmission manufacture and foundry facilities at Fishermens Bend. * £750,000 is spent on fabrication equipment, presses and a new paint shop at Woodville, S.A.
* Over 300 Australian supplier companies gear up to fulfil Holden contracts for materials, parts, components and services. * Death of company Chairman, Sir Edward W. Holden. * The first production schedule is finalised on 5 April, the first body is completed at Woodville in July. * The name ‘HOLDEN’ is announced. The model’s engineering prefix is 48-215. It is later nicknamed ‘FX’, to distinguish it from its FJ successor. * Holden Number One (body No.6) is the first production-ready car to come off the Fishermens Bend line, on 1 October. 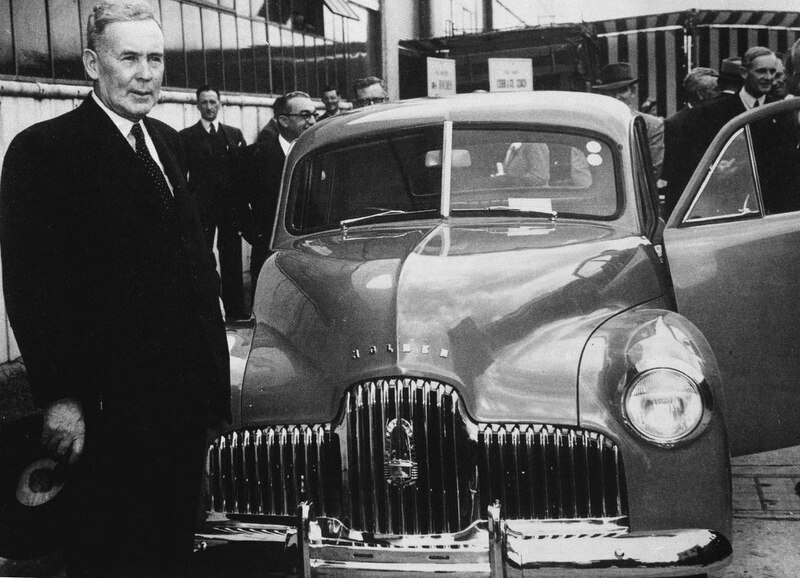 * 1,200 official guests, headed by the Prime Minister, Mr Ben Chifley, attend the public announcement of ‘Australia’s Own Car’ on 29 November at Fishermens Bend. The ceremony also marks the inauguration of the Australian automotive industry. * 26,000 GM-H employees and family members preview the new model at Open House gatherings at plants nationwide, Holden dealers and distributors attend special launches. * Initial production capacity averages 10 vehicles a day. * Demand for the 48-215 far outstrips supply and waiting lists are oversubscribed. * GM-H aims at annual production of 20,000 units. * Production lifts to 100 units per day to reach an annual total of 20,113 vehicles. * $43 million is paid to outside suppliers of components, materials and services. * New vehicle registrations in Australia total 206,087 – almost 70 per cent up on the previous year. * Total sales of GM-H products exceed the 1949 total by 60 per cent. * The number of Holden employees Australia-wide exceeds 10,000. * GM-H acquires a Port Melbourne company to manufacture Holden electrical harness, electric components and AC Spark Plugs. * Production rate reaches 100 units a day. Total 48-215 production passes 50,000 units. * The first Holden ‘Coupe Utility’, the 50-2106, is launched; PVC interior trims are introduced. * GM-H buys 152 acres at Dandenong, Victoria for future expansion programs. * On Holden’s fourth birthday, GM-H announces an £11 million expansion program designed to raise output to 200 units a day. Melbourne, Sydney and Adelaide plants are to be enlarged and modernised, production efficiency and quality levels lifted. Holden annual sales reach 32,000. * The Holden Business Sedan, with heavy duty items for taxi and fleet use, is introduced in July. * The famous FJ Holden is launched in September. * Based on record sales, GM-H makes the largest profit in its history and creates 1,700 new jobs. * Earl C. Daum is appointed Managing Director. * Further expansion plans are announced. The aim is to produce 72,000 units per annum. * Exports of fully built up Holdens to New Zealand begin in November. * Australian vehicle registrations are the highest ever recorded, and one in every three vehicles on Australian roads is a GM-H product. * Seven GM-H plants employ 13,822 people. * While Holden passenger cars accounted for 26.95 per cent of all registrations and the Holden Ute has a 32.1 per cent share, market leader GM-H reports that these figures did not reflect true demand as availability was limited by production. * 1,341 Holdens are exported. * 2,152 acres of land are selected at Lang Lang, Victoria, and plans to construct ‘a modern and completely equipped proving ground’ – Australia’s first – commence. * Work begins on the Dandenong (Vic) plant. * It is 100 years since James Alexander Holden set up a saddlery business in Adelaide. * In January, the 250,000th Holden (an FJ) is built and the tubeless tyre is introduced. * The new Dandenong body and assembly plant opens. * The first entirely new Holden since the 48-215, the FE, is launched in July following four years of development and a £4 million investment. * CKD (completely knocked down) Holden packs are exported to New Zealand for the first time. Holdens are shipped to Thailand, Malaya and North Borneo. * Employee numbers top 16,000; Holden dealers and distributors employ a further 14,000. * The first Holden station sedan, based on the FE sedan, is produced in March. * 4,500 Holdens are exported to 17 markets, which include Hong Kong, Sudan and East Africa. * GM-H achieves a new sales record, increases its share of total registrations to 46.3 per cent. * The Lang Lang proving ground commences operations in August. * The one millionth car body is produced at the Woodville plant. * NASCO parts operation commences at Dandenong. * A £9 million expansion of plant and manufacturing facilities, aimed at increasing annual production to 125,000 units, is announced. Planning of a new facility at Elizabeth, S.A., begins. * The FC Holden is launched in May. * Holden passenger cars account for 47.4 per cent of total registrations, the Holden Ute records 49.6 per cent of the light commercial market. * The total number of Holdens produced exceeds 500,000. * Employee numbers reach 18,699 – an increase of over 10,000 in 10 years. * Work begins on a banked, circular high-speed test track at the Lang Lang proving ground. * Total exports since 1954 exceed 14,000. Assembly of CKD Holden Ute commences in Indonesia and South Africa. * New Body Hardware plant at Elizabeth (S.A.) begins production. * The first transistor car radios are offered as an option. * Harlow W. Gage is appointed Managing Director. * The FB Holden is launched in January. * Holden sales top 12,000 per month. * Left-hand drive production for export markets begins, the first shipment to Hawaii follows. * The EK Holden is launched in May. * A new body assembly plant opens at Elizabeth, a new 6-cylinder engine plant at Fishermens Bend nears completion. * The EJ Holden is launched in July. * When the millionth Holden, a gold EJ Premier, is built at Dandenong in October, it is estimated that if these cars were placed bumper to bumper they would stretch from Geraldton (W.A.) to Townsville (Qld). * David L. Heglund is appointed Managing Director. * The new engine plant and foundry commence operations at Fishermens Bend; capacity is 700 engines a day. * Further expansion plans, with a 175,000 annual production target, are announced. * Elizabeth (SA) trim assembly plant and paint shop commence operations. * The EH Holden is introduced in August. * GM-H retains sales leadership for 12th successive year, sets new sales records. * Dealers and distributors with Holden franchises operate in 59 export territories, exports total 10,798 units. * A new Technical Centre opens at Fishermens Bend. It houses over 900 designers, engineers, draftsmen, modellers, technicians and skilled tradesmen and provides state-of-the-art automotive design and development facilities. * Trim fabrication plant commences operation at Elizabeth (SA). * Construction of Acacia Ridge (Qld) plant commences. * The EH is the best-selling Holden model thus far (250,000 units). * The radical new HD model is introduced in February. * Holden retains long-term sales leadership record, outselling its nearest competitor by more than 3:1. One out of every three cars on Australian roads is a Holden. * Exports increase by 41 per cent to total 19,369 units. * A new, mechanised grey iron foundry at Fishermens Bend begins pouring. * The 1,500,000th Holden is produced, at the Pagewood Plant, Sydney. Australian content exceeds 95 per cent. * 601 Holden dealerships nationwide employ over 20,000 people. * The HR Holden is launched in April. * GM-H is the first Australian manufacturer to fit seat belts on all models. Its vehicles provide class-leading levels of standard safety features. * Investment in expansion continues. Vehicle assembly at the Acacia Ridge, Qld, plant commences. * Student Driver Education program announced. * Australian-made torque converter production commences at Dandenong. * Holden accounts for 56.2 per cent of all Australian motor vehicle exports. * Max E. Wilson is appointed Managing Director. * GM-H increases its market coverage and improves its market position with the launch of the first small Holden, the HB Torana. It takes its name from an Aboriginal word meaning ‘to fly’ and is based on the Vauxhall Viva. * The 100,000th export Holden is produced. * New nodular iron foundry, officially opened by Prime Minister Harold Holt, commences production at Fishermens Bend. * Safety Design Test Centre at Lang Lang proving ground and automatic transmission plant announced; new electroplating plant opens at Woodville (SA). * The HK Holden is introduced in January. * The Holden Monaro and Brougham models make their debuts in July. * Holden introduces the energy-absorbing steering column to the Australian market. * Torana bodies are made in Australia for the first time. * Work progresses on a V8 engine plant at Fishermens Bend. * More than 4,000 Australian companies are supplying Holden with components, materials and services. * Alexander D. Rhea is appointed Managing Director. * McPhee/Mulholland win the Bathurst enduro in a Monaro GTS. * The two millionth Holden, a gold HK Brougham, is produced in March at Dandenong. * The HT Holden is launched in May. * Australia’s first automotive Safety Design Test Centre opens at Lang Lang proving ground, complete with barrier test and Hyge sled facilities. * A V8 engine manufacturing plant opens at Fishermens Bend. The first Australian-made V8, developed at a cost of $22.5 million, is exhibited in the advanced, mid-engined Holden Hurricane experimental car. * Automatic transmission production commences. * The two millionth Holden is produced . * GM-H moves into the small/medium market sector with the launch of the locally designed 6 and 4 cylinder LC Torana series, which includes the sporty Torana GTR. * GM-H employs almost 26,000 people at 10 locations nationwide. * The Bond/Roberts Monaro GTS wins Bathurst in the Holden Dealer Team’s debut year. * The HG Holden is launched in July. * Total annual Holden sales exceed 200,000. * The performance-oriented GTR XU1 LC Torana, the first Holden with an aerodynamic spoiler, is introduced. * A fibreglass-bodied Torana experimental model, called the GTR-X, is exhibited to gauge public reaction. * A $16.5 million Tri-Matic automatic transmission plant, Holden’s first, opens at Woodville, SA. * Total export revenue rises to $42 million, almost double the 1968 figure. Seven overseas plants assemble Holden vehicles from Australian-manufactured components. * A.C. (Bill) Gibbs is appointed Chairman & Managing Director. * Safety upgrades across the Holden range see heater/demisters and rear seat belts fitted as standard. * The HQ range is introduced in July, following the most ambitious product development program undertaken by GM-H since the first Holden. * Holden’s first luxury long-wheelbase derivative, the Statesman, is launched. * The first car-based Holden cab/chassis light truck, commonly known as the ‘one tonner’, is announced as part of the HQ range, which boasts the largest-ever selection of 18 model variants. * The GM-H national parts distribution complex opens at Dandenong (Vic). * The LJ Torana is launched. * The 2,500,000th Holden car comes off the line at Dandenong, Vic. * Holden exports its 250,000th vehicle in October. * Peter Brock wins at Bathurst for the first time, in a Torana XU-1. * Holden celebrates the 25th anniversary of manufacture in Australia. * The first sled test-developed child safety capsule is developed. * A record export year for Holden, with 41,000 vehicles exported. * The HQ Monaro GTS 4 door sedan is introduced in April. * Damon Martin is appointed Managing Director. * The three millionth Holden is produced. * Launch of the LH Torana range in April. Holden’s first all-Australian medium car is one of few offered with a choice of 4 cylinder (TA Torana), 6 or 8-cylinder engines. * The 3 millionth Holden, a white HQ wagon, is produced at Pagewood in June. * The HJ Holden is launched in October. * The Statesman Caprice makes its debut. * The Holden TX Gemini, an all-new, Australian-assembled version of GM’s first world car, is released in sedan and coupe models. It soon becomes Australia’s most popular small 4-cylinder car and 42,792 TX models are built. * Active safety programs are operated by all Holden plants. * The Brock/Samson Torana L34 is victorious at Bathurst. * General Motors celebrates 50 years in Australia. * GM-H confirms plans to manufacture 4-cylinder engines at Fishermens Bend. * The Holden LX Sunbird replaces Torana 1900 4-cylinder sedan, introduces ‘RTS’ (Radial Tuned Suspension). * The Morris/Fitzpatrick Torana L34 wins at Bathurst. * The TC Gemini is introduced. * The A9X LX Torana V8 sedan and hatch are released. * The HZ Holden is launched in October. * Holden introduces Radial Tuned Suspension (RTS) to Torana and full-sized models. * Holden celebrates its 25th straight year of overall market leadership. * UC Torana/Sunbird 4- and 6-cylinder models are released. * TD Gemini is released. * Launch of the VB Commodore in October signals a major change of direction. * GM-H proposes concept of export facilitation in conjunction with a major investment in 4-cylinder engine to power economical GM world car. * UC Sunbird SLE sedan and hatch feature locally-made ‘Starfire’ 4-cylinder engine. * The Brock/Richards Torana A9X wins at Bathurst. * Holden announces a $300 million expansion plan, which includes a new 4-cylinder engine plant and foundry modernisation program at Fishermans Bend. * VB Commodore station wagon models introduced in July. * A $6.7 million program to enable assembly of Commodore at the Elizabeth (SA) plant is announced in August. * VB Commodore attains 1-2-3 victory in the Repco Round Australia Rally in August 1997. * TE Gemini range is introduced in October. * Brock and Richards take the Bathurst title in a Torana A9X. * Commodore is Australia’s top selling car, with 63,989 sedans and wagons sold. * Commodore makes its motor racing debut in the opening round of the ATCC at Symmons Plains (Tas) in February. * VC Commodore is released in March. * WB versions of the Statesman de Ville, Caprice and Holden’s car-based commercial vehicles are launched in April. * Commodore assembly ceases at Pagewood (NSW) plant in August. Commodore production to be concentrated at Dandenong (Vic) and Elizabeth (SA) plants. * The first HDT (Brock) Commodore is released in October. * The Isuzu-sourced Holden Rodeo light commercial range (the first 4-cylinder Holden commercials), goes on sale. * GM-H opens a new Management & Technical Education Training Centre in Melbourne. * The Brock/Richards pairing wins Bathurst once more, in a VC Commodore. * In January Holden public affairs director Evan Green and Sydney Sun-Herald motoring editor Matt Whelan complete a 14,831km trip around Australia in a 4-cylinder VC Commodore to demonstrate the car’s fuel efficiency and durability. * The TE Gemini, Holden’s first diesel-engined passenger model, is launched in April. * The 4 millionth Holden, a two-tone gold VC Commodore SL/E, is produced in June at Dandenong and is driven off the line by Sir Laurence Hartnett, acknowledged father of the Holden car project. * Holden’s Acacia Ridge (Qld) plant builds its half-millionth car, a Gemini SLX. * The Isuzu-sourced Jackaroo, Holden’s first 4WD passenger vehicle, is announced in October. * The VH Commodore is launched in September. * Holden’s new engine plant is commissioned and begins production of Family II four-cylinder engines. Exports of these begin with a shipment to England. * GM-H notches up 29 consecutive years of market leadership. * The Shuttle, Holden’s entry into the forward control van market, is unveiled in February. * The TF Gemini is launched in March. * Holden’s version of GM’s international “J-Car”, the JB Camira sedan, is released in July. The first front-wheel drive car produced by Holden, it is powered by the Australian-built Family II four cylinder engine. * Brock/Perkins win at Bathurst in a VH Commodore. * Engine plant production reaches 1,000 units a day and the 200,000th engine is built. By year’s end, the 250,000th engine is exported. * GM-H announces a model-sharing program with Nissan for a small 5-door hatchback. * The Brock/Perkins/Harvey VH Commodore is victorious at Bathurst. * The VK Commodore is launched in February. * Representing the first example of local model-sharing, the Nissan joint venture LB Astra 5-door, front wheel drive hatchback is launched in August. * Production of WB Statesman models and car-based light commercials is discontinued in October. * The JD Camira, with port fuel injected 4-cylinder engine, is introduced in November. * Holden’s annual export revenue exceeds $200 million. * Brock/Perkins win Bathurst in a VK Commodore. * The Suzuki-sourced MB Barina hatchback and small 4WD Drover wagon are released in February. * All-new RB Gemini (assembled in SA) is released in April. * Scurry delivery van (Suzuki) is released in July. * A single point tool body assembly shuttle is introduced at the Elizabeth manufacturing facility. * Closed loop catalytic converters become standard on all Holdens. * The VL Commodore and LC Astra are launched in February. * General Motors-Holden’s Ltd is reorganised into two GM subsidiary companies: Holden’s Motor Company (HMC) and Holden’s Engine Company (HEC). * The Izusu-sourced Piazza coupe is released in April. * ML Barina is launched in September. * The Holden V8 returns in October with the introduction of an unleaded petrol version of the Australian-designed engine on the VL Commodore range. * VK Commodore Bathurst victory to Grice/Bailey. * JE Camira, featuring a major engine upgrade, is launched in April. * All-new LD Astra, powered by a Family II 1.8 litre engine, joins the Holden range in September. * Holden makes a significant contribution to the GM Sunraycer’s victory in the first cross-continental solar race, the World Solar Challenge, which is run from Darwin to Adelaide. * GM and Toyota announce plans to establish a joint venture in Australia to co-ordinate design, engineering and product sharing strategies. * John G. Bagshaw is appointed Chairman & Managing Director. * Brock/Parsons/McLeod win Bathurst in a VL Commodore. * Agreements are signed to create United Australian Automotive Industries Ltd (UAAI), the controlling company for a Holden-Toyota joint venture. The GM arm of the new company is called General Motors-Holden’s Automotive Limited (GMHA). * Holden Special Vehicles commences operations in February. * The one millionth Holden Family II 4-cylinder engine is exported. * All-new TF Rodeo range is introduced in July. * The VN Commodore is launched in August. It is built exclusively at the Elizabeth (SA) plant. * The MF Barina is released with a completely new “aero” body. * All-new Toyota-sourced JK Apollo is launched in August. * Holden declares an operating profit of $157.3 million after tax, on sales of $2178 million. * GM and Isuzu form joint venture company in Australia, Isuzu-General Motors Australia Limited, to manufacture and market commercial vehicles through Holden’s. * The VN Commodore range wins major Car of the Year awards. * All-new Toyota-sourced LE Nova is launched in August. * Holden commences export of its first stretched limousine; the VN Calais-based Holden Royale. * Holden Commodore is Australia’s best-selling car for 1989. * Holden rejoins the long-wheelbase field with the introduction of VQ Statesman and Caprice luxury models. They feature the first independent rear suspension fitted to Australian-designed and built rear drive cars. * The 5 millionth Holden, a red VN Calais, is produced, at Elizabeth, S.A.
* The VG Holden Ute, first Commodore-based ute, is launched in September. * The JL Apollo is launched in November. * Holden’s last Group A, the VN Commodore SS Group A SV, released in November. * The VN Commodore remains Australia’s best-selling car. * William J. Hamel is appointed Chairman & Managing Director. * The Percy/Grice VL Commodore wins at Bathurst. * Holden’s Engine Company (HEC) marks 10 years of Family II engine manufacture; total export revenue tops $1.9 billion, making HEC one of Australia’s foremost exporters of manufactured goods. * A new VN Commodore S Wagon is introduced in May. * The MH Barina is launched in September. * The LF Nova and Holden Calibra coupe (first Holden to be sourced from European GM affiliate Opel) are launched in October. * The VP Commodore is announced in November. * For the third consecutive year Commodore maintains its position as Australia’s top-selling car. * Reinforcing Holden’s commitment to safety, ABS become available on IRS-equipped Commodore and Calais sedans. * Holden leads the way in customer care with the introduction of a no-cost roadside service package and an extended warranty initiative. * An all-new Jackaroo, with V6 engine, is launched in April. * Holden invests $100 million in plant and equipment in readiness to build the VR Commodore. * Holden introduces a fully-warranted LPG/petrol (dual fuel) option on V6 automatic Executive and Berlina sedans. * The medium-sized JM Apollo, with 4- and 6-cylinder powertrains, is launched in March. * The VR Commodore is launched in July. With this range, Holden becomes the first Australian maker to fit a driver’s airbag supplementary restraint system. It is developed specifically for drivers wearing seat belts. * Perkins/Hansford take out Bathurst in a VP Commodore. * A $150 million, state of the art paint facility opens at Elizabeth (SA). * The VR Commodore achieves the distinction of being Australia’s most-awarded car ever. * VR Statesman and Caprice models released in March. * All-new, European-sourced SB Barina released in April. * Prime Minister Paul Keating attends a ceremony to mark production of Holden’s two millionth export engine. * The Holden V8 celebrates its 25th anniversary. Over 450,000 have been built. * LG Nova, with all-new body, is launched in October. * The VR Commodore tops the passenger car market. Holden production is up 25 per cent on 1993, sales grow by 19.5 per cent. * Holden wins the inaugural Motor magazine award for outstanding achievement in the Australian automotive industry. * The new VS Commodore range debuts in April. It features a new 3800 ECOTEC engine, the result of a $20 million technology investment, and the first application by an Australian manufacturer of driver and passenger airbags. * A VR Commodore, driven by Ed Ordynski, wins the Mobil 1 Round Australia Trial in June. * The 2-door, 4WD Holden Frontera sports wagon (UK sourced, powered by Holden 4-cylinder engine) is released in September. * JP Apollo upgrade is released in September. * Holden’s field accident research program earns it the National Road Safety Award. * The Elizabeth manufacturing facility produces 107,000 vehicles and sets a new production record. * A VR Commodore, driven by Perkins/Ingall, takes the Bathurst title. * The SB Combo, a Barina van variant, is released in March. * The GM/Toyota joint venture is dissolved. The operations of Holden’s Engine Company are re-integrated into Holden’s manufacturing operations. * Holden announces plans to build a second car line at Elizabeth to produce the medium-sized, export-orientated Holden Vectra. * The Supercharged V6 engine is introduced on Calais, Statesman and Caprice. * Holden is the first Australian manufacturer to be certified to International Quality Standard ISO9001. * Launch of the European-sourced TR Astra compact, in August. o Holden Commodore records a best-ever sales year and regains its top-selling title. * Lowndes/Murphy win Bathurst in a VR Commodore. * Holden is formally established as the General Motors Product Engineering Centre for the Asia Pacific Region. * For the eighth successive year, Holden leads the industry in terms of financial performance. * Holden is named a major sponsor of the Sydney 2000 Olympic Games. * The European-sourced JR Vectra enters the medium sized car market in June. * The totally new VT Commodore model range is introduced in September. It represents a $600 million investment and the culmination of the largest and most ambitious new vehicle engineering program Holden has ever undertaken. * The Lang Lang proving ground complex passes a 40-year milestone. * The SB Barina Cabrio, first Holden convertible, is launched in October. * On 29 November, Holden begins a year of 50th anniversary commemorative activities. * James R. Wiemels,Vice President, General Motors Corporation, is appointed Chairman & Managing Director. * The VT Commodore wins a variety of prestigious motoring and design awards. * The Holden Commodore nameplate retains its top-selling title. * Perkins/Ingall take out Bathurst title in a VS Commodore. * The VT Commodore is named Wheels magazine Car of the Year. * GMHA is renamed Holden Ltd.
* Holden announces a major export drive in May. Shipments of left-hand drive Commodores to the Middle East begin in June; LHD Commodore exports to Latin America and Vectra exports commence in the final quarter. * Holden is the first Australian manufacturer to offer side impact airbags, optional on Holden Acclaim, Berlina and Calais models. * The new second car line at Elizabeth (SA) commences production of JS Vectra sedans and a new wagon model, which are launched in July. * New TS Astra range (European-sourced) is launched in September. * Holden shows off a stunning Commodore-based coupe design study at the Sydney Motor Show in October. * Holden receives the SAE Gold Automotive Engineering Excellence Award for VT Commodore safety systems. * Holden records its best sales results in 20 years and Commodore retains Australia’s most popular car title. * Holden gives the green light for a Commodore coupe. * Olympic Edition Jackaroo and Rodeo ‘Sport’ model introduced. o Holden introduces ‘SatNav’ (guidance technology) option across the Commodore and Calais range. * Peter Hanenberger, a Group Vice President of General Motors Corporation, is appointed Holden Chairman and Managing Director. * The Series II VT Commodore and Calais range is launched. * The all-new WH series Statesman and Caprice models are launched and the introduction of the GEN III V8 begins a powerful new era of Holden performance. * The 3 millionth Family II four-cylinder engine is exported. * Introduction of the JS Series II Vectra. * Holden’s vehicle export drive steps up as the first WH models are shipped to the Middle East. * Release of the first Olympic Edition Commodore, Vectra, Astra and Barina. * Australia’s most popular car, the Holden Commodore, attains 21 year milestone in October. * The Murphy/Richards combination celebrates Commodore’s coming-of-age with victory at Bathurst. * Holden closes the millennium by winning total market leadership for the first time in 18 years and achieving record production at its Elizabeth manufacturing facility. * Holden gears up for a big year as Official Olympic Partner for the Sydney 2000 Olympic Games; its role includes supporting the Olympic Torch relay and supplying a 3,500 vehicle fleet. * The Series II Olympic Edition Commodore is introduced. * The Astra sedan is introduced. o Holden and CSIRO showcase advanced, fuel-saving hybrid-electric technology. * Launch of the added value Olympic Edition Holden Ute. * Holden’s side impact safety research project wins Engineering Excellence Award. * The Holden/CSIRO ECOmmodore hybrid-electric concept car is unveiled. * Series II Olympic Edition Vectra, Astra and Barina introduced. * The VX Commodore and Calais launched in August. * The retro Sandman panel van concept stars at the Sydney Motor Show. * The Bargwanna/Tander V8 Supercar Commodore wins at Bathurst. * The all-new VU Holden Ute is released in December. * Holden announces plans to establish a new V6 engine plant at Fishermans Bend. * Holden confirms that the Commodore coupe will carry the Monaro nameplate. * All-time record production at Elizabeth (133,016 vehicles)and Fishermans Bend (390,000 engines including 1 millionth V6) manufacturing plants. * Holden Commodore is Australia’s top-selling car for the fifth consecutive year. * Holden wins total market leadership for 2001 and Commodore is the Australia’s top-selling car for the 6th consecutive year. * Holden sets all-time sales record for an Australian carmaker, wins total market leadership for 2002. Commodore is Australia’s top selling car for seventh consecutive year. * Launch of new-design VY Commodore and Ute. * Holden becomes strategic partner in General Motors Daewoo Auto & Technology Company, taking 42.1 per cent stake in the global company. * Construction of high feature V6 engine plant building completed at Fishermans Bend – start of production planned for October 2003. * Monaro wins the Australian Design Award in the Industrial Design Category and special accolade from Design Institute of Australian in its Industrial Design Selection. * Holden commences child restraint research and test program with Monash University Accident Research Centre and runs first computer brain validation test for world-leading study. * Holden’s first major export program to US announced – 18,000 units per year for Monaro coupes prepared as the Pontiac GTO. Middle East export program for coupes also confirmed. * Launch of all wheel drive Cruze. * Announcement of $2 billion capital expenditure program from 2002 to 2006. Program expected to boost 2003 production by 21 percent. * Holden rates fifth amongst Australia’s Top 100 companies in Fairfax Reputation Index. * Holden ranked No.5 in Australia in the Reputation Quotient, a study of corporate reputations by Harris Interactive Australia. * Holden Racing Team’s Mark Skaife/Jim Richards V8 Supercar wins Bathurst 1000. * Plans announced to employ an extra 1000 people at Vehicle Manufacturing Operations in Elizabeth, SA, with commencement of a third shift. * $200 million redevelopment of Holden’s Fishermans Bend precinct announced. * Launch of new generation Rodeo light commercial range in February. * Holden continues emphasis on child safety, initiates free child seat inspection service. * WK Caprice and Statesman introduced. * Holden Innovation R&D centre opens. * Turbocharged Astra SRi and Convertible introduced. * SS Commodore wagon introduced. * Launch of ‘reborn’ Holden One Tonner cab chassis range in May. * Third shift commences at Elizabeth Vehicle Operations in June. * Launch of VY Series II Commodore, Berlina, Calais, Ute, One Tonner and Series III Monaro in August. * Crewman four-door ute introduced. * Adventra all wheel drive crossover wagon launched in September. * October marks 50th anniversary of FJ Holden, 25th year of Commodore production. * One Tonner-based SST custom pickup, Holden designed and V8-powered Elfin sports cars unveiled at Melbourne Motor Show. * Long wheelbase export program to South Korea confirmed in March to start in early 2005. * Holden and Monash University Accident Research Centre extend safety research program to Middle East; announce $1 million vehicle simulator upgrade to assist local safety research. * Announcement of Global V6 engine plant capacity expansion to annual maximum of 240,000 units. * Convertible Monaro engineering study unveiled, Holden concept cars from 1969-2003 displayed in May. * Elizabeth manufacturing facility undergoes major revamp in July as part of $400 million capital expenditure project. * Holden Caprice named Saudi Arabia’s 2004 Car of the Year. * Holden reveals details of high feature, locally produced Alloytec V6 engine. * Last ECOTEC V6 engine produced at Fishermans Bend in July. * Upgraded VZ Commodore, Berlina, Calais, Ute Crewman, One Tonner and WL Caprice and Statesman launched in August. * Free mobile child seat inspection service extended from Sydney and Melbourne to Adelaide. * Holden Ltd and Saab Automobile Australia announced integration into a single business entity from 1 January 2005. * 260kW VZ Monaro and all-new AH Astra hatch released in September. * Torana TT36 hot hatch showcar unveiled in October at Australian International Motor Show, Sydney. * Holden Commodore (Greg Murphy/Rick Kelly) wins Bathurst 1000 for sixth successive year. * Fifty years of Holden exports milestone passed in November. * Holden and CSIRO announce future powertrain research program. * Commodore tops passenger car market for ninth consecutive year. * Holden breaks single-year vehicle export record. * 40th anniversary of General Assembly Plant opening at Elizabeth in January. * One Tonner, Crewman Cross 6 models and Adventra V6 released February. * Plans confirmed to import vehicles from GMDAT, South Korea. * New corporate HQ at 191 Salmon Street Port Melbourne officially opened in May; Statesman exports to GM Daewoo, South Korea, commenced. * Company name changed to GM Holden Ltd, effective 1 June. * 40,000th Monaro-based coupe sold, special edition CV8Z announced to mark final chapter of Monaro production. * Astra 3-door coupe and wagon launched July, Tigra hardtop convertible in September. * Holden Commodore (Mark Skaife/Todd Kelly) wins Bathurst 1000. * New Viva and Barina model ranges launched, Efijy custom coupe, SX3 7-seater SUV concept unveiled at Sydney Motor Show in October. * Four millionth Holden engine exported in November. * Expanded GM global design role announced for Holden in December; Global V6-engined Rodeo announced. * Commodore Australia’s top selling car for tenth successive year. * Holden sets all-time vehicle export record with 60,158 sedans, utes and coupes shipped to global markets. * 6.0L Gen IV V8 engine, the most powerful standard Holden engine ever offered, replaces Gen III V8. * Last Monaro produced is auctioned for charity in February, fetches $187,600. * Astra turbo diesel, T2X sports utility concept, Barina sedan unveiled at Melbourne Motor show in February. * Astra TD five-door hatches launched in June; Holden announces VE Commodore will be first of offer ESP safety technology across the range. * Launch of new generation VE Commodore, Berlina and Calais in July. * Launch of WM Caprice and Statesman in August; PM John Howard commemorates completion of a $532 million upgrade to the Vehicle Operations plant at Elizabeth, SA; Holden airship flies maiden voyage. * First VE Commodore and WM export models shipped to Middle East. * 150 Global V6 engines worth $500,000 donated to Automotive Training Australia. * Holden Captiva SUV range launched in October; dual fuel Alloytec V6 engine released. * Astra TwinTop convertible and SRi hatch debut, H3 HUMMER previewed at Sydney Motor Show. * Rick Kelly wins V8 Supercar Championship. * Commodore Australia’s best-selling car for 11th successive year. * VE Commodore awarded 2006 Wheels Car of the Year. * Mid-sized Epica sedan debuts at Brisbane Motor Show in February with April on-sale date. * New export market for VE sedans announced – SS Commodore to be sold in the US as Pontiac G8. * Diesel version of Captiva SUV released in February. * Rodeo range upgraded – adds new turbo diesel engine. * In March Holden named Employer of Choice for Women for 3 rd successive year. * Exports to Korea of WM Caprice-based model and Global V6 engine exports to China confirmed in April. * VE Commodore and WM Caprice win Australian Design Awards in May. * All-new VE Ute range launched in August. * Lang Lang proving ground celebrates 50-year anniversary in September. * VE Commodore Sportwagon makes debut at Sydney Motor Show. * Full production of Pontiac G8 sedan commences in December. The GM Holden production line produced more than 7+ millions of vehicles and closed it’s production line on a Thursday afternoon 20/10/2017. 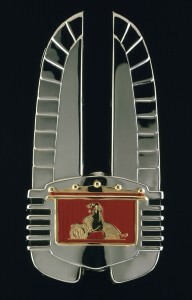 The Iconic Holden will remain as a quality Australian motor car built for Australia by Australians.